Ultra-diffuse galaxies are as faint as dwarf galaxies, but spread over an area the size of the Milky Way — with about 1/1000th the number of stars. A new simulation suggests many supernovas at the beginning of a galaxy's life can push the stars and dark matter outward to a great size. Two simulated ultra-diffuse galaxies are pictured here on top of a Hubble Space Telescope image of background galaxies. Like ghosts, ultra-diffuse galaxies often float undetected in the night sky — stretching the size of the Milky Way, but containing only a dwarf galaxy's worth of stars. Now, a new simulation suggests their explosive origins, and hints that there may be many more than seen so far. Researchers uncovered the first ultra-diffuse galaxy in 2015, and were puzzled by how the faint galaxy came to have such a large size with so few stars. Since then, they've spotted many more with the most sensitive telescopes, mostly in large clusters of many galaxies. But this new research suggests that internal dynamics in a forming galaxy, rather than processes happening within clusters, can blow a dwarf up to enormous, spread-out size — and thus they may pepper the universe even far from large clusters, hiding in plain sight because of their faintness. "Once stars explode supernovae, they release a lot of energy into the surrounding gas, and this gas can be expelled really, really fast," Arianna di Cintio, a researcher at University of Copenhagen's DARK Cosmology Center and lead author on the new work, told Space.com. If dwarf galaxies experience enough of these supernovas early on in their lives, she said, the galaxy can balloon outwards, borne on the outflows of gas. "Basically, the dark-matter particles start flying outwards from the center of the galaxy, and this process happens for the stars as well," di Cintio said. "At the end of the day, you form a galaxy which has few stars, so it's a dwarf galaxy, but the stars have spread over a large, large surface — something similar to the Milky Way." Thus, the galaxies' few million stars puff up to fill a space that could ordinarily host about 1,000 times that number. This video from NIHAO (PI A.V. Macciò, NYUAD) shows a simulation of an ultra-diffuse galaxy's formation, depicting the fountains of gas launching out of the galaxy. 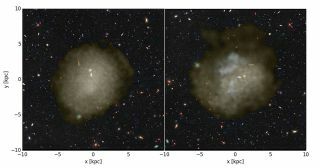 It's easier to find ultra-diffuse galaxies in big galaxy clusters because that's where the most powerful telescopes set their sights — for instance, the National Astronomical Observatory of Japan's Subaru telescope found 854 of them in the Coma Cluster, according to a statement by the university's Niels Bohr Institute. Just a few have been found so far floating on their own, di Cintio said. The fact that the simulation created these familiar — albeit mysterious — structures is "a very, very nice confirmation of what we think is there — the current cosmological model," di Cintio said. "This effect of expansion of dark matter and stars, we knew that it existed for a few years, [but] no one connected it yet to ultra-diffuse galaxies because they weren't observed yet." Some of the 854 ultra-diffuse galaxies found by the Subaru Telescope in the Coma galaxy cluster, about 300 million light-years away. Three hundred and thirty-two of them are Milky Way-size. Di Cintio said the next steps are to try and verify more ultra-diffuse galaxies living on their own, outside of big clusters, and to measure their mass — potentially through gravitational lensing — to help verify that they're really dwarf-galaxy-mass. In general, further research will help researchers discover extremely faint, low-surface-brightness galaxies that may lurk in our telescopes' fields of view. "So far, we were blind, in a certain sense, to these low-surface-brightness and ultra-diffuse galaxies," di Cintio said. "We may be looking around and finding thousands of galaxies that we didn't even think about yet."